On special occasions, I love to impress my guests with this wonderful and very easy classic french dish. This is one of those dishes that is so easy to make ahead of time and just “pop” in the oven when ready for dinner. I also love pairing this with a porcini mushroom risotto (more on that later). I thought this classic dish would be a great dinner for Valentines Day, so when I had my date for “Live at 9”, I knew this would be the one….hope you enjoy and I really hope you make this at home…. Heat a medium sized saute pan over medium heat, add butter and melt. Add the shallots & garlic, saute until soft, about 5 minutes. Add remaining ingredients and cook until wine has evaporated. Preheat oven to 425 degrees. Generously spray a cooking sheet with cooking spray. In a large skillet, heat oil. 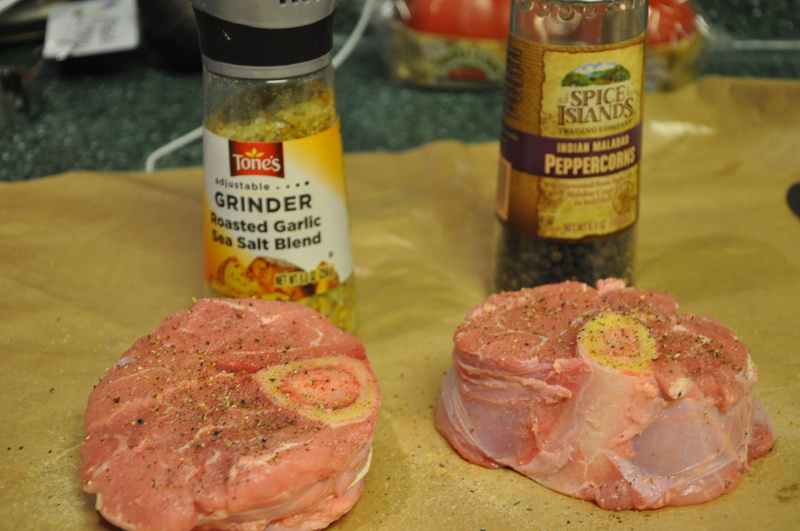 Generously sprinkle both sides of filets with salt & pepper. Place in hot skillet and sear filets on all sides until brown. Remove from skillet. On a lightly floured surface, roll out the puff pastry large enough to wrap around the beef. Divide mushroom mixture in fourths and place in center of pastry. Top mushrooms with filet. Brush the edges of the pastry with egg wash. Wrap filet with pastry cutting off any extra (use the extra for topping wellington with shapes or initials). Place seam side down on baking sheet and top wellington with egg wash. Bake 15-20 minutes or until pastry is golden on top. Use an instant read thermometer for accurate meat temperature (125 for rare, 130 for medium) let meat rest 5 minutes before serving. In a small sauce pan, melt butter over medium heat. Add shallots and cook until soft. Add demi glace and red wine. 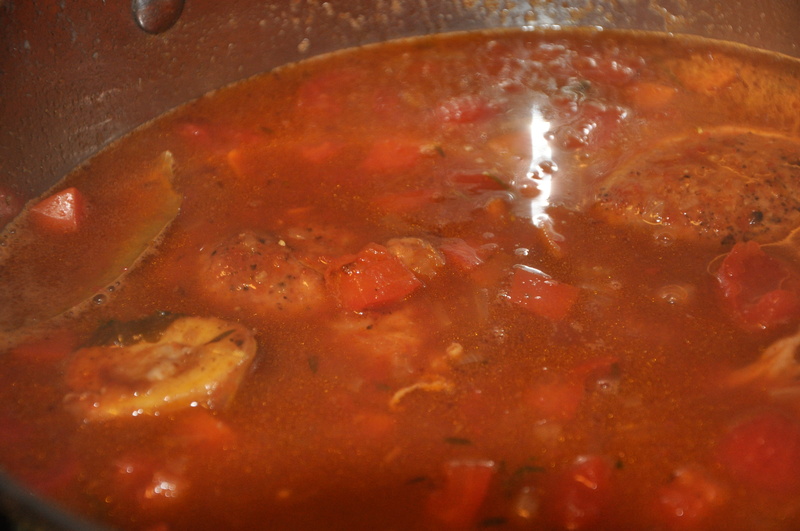 Cook until mixture is reduced by half. Add heavy cream. Serve immediately. 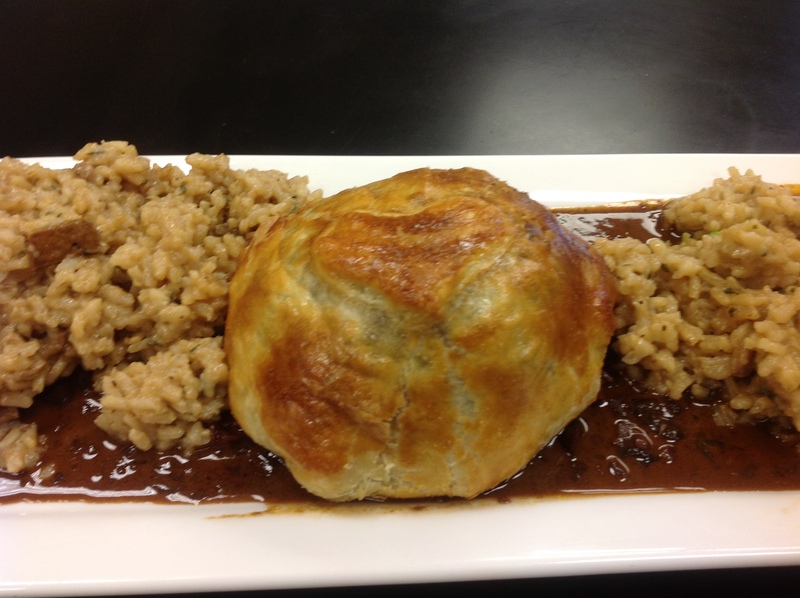 Place wine sauce on a serving dish and top with beef wellington. People always ask me where I like to go out for dinner, what’s my favorite restaurant?That is usually a pretty tuff question, not that we don’t have some great restaurants in the Memphis area, but I am always in search of a great Italian restaurant, and there is only one that I can name, “Pasta Italia”. Unfortunately the owners packed up the restaurant and headed to Chattanooga a few years back….but this story has a happy ending, the owners decided to returning to this area….great news!!!! After hearing this news yesterday, I started to think about one of my favorite meals at this restaurant and great Italian restaurants in other cities and I have to admit, one of them is Ossoboco. Now, this is not a difficult dish to make, so why don’t I make it that often? Guess this is one that I really like to have out, best part is eating the marrow out of the bone…total yum! Yesterday I decided to stop at Fresh Market and purchase a couple of “veal shanks”…a little costly, but once again, this is a special dish. I hope you try this recipe at home. I served it with some orzo pasta, pre boiled in water, drained, simmered in beef stock with fresh mushrooms, chunks of fresh tomatoes and spinach. This really was a perfect accompaniment to the Ossoboco. In a large pot over medium heat, add butter and oil. Place flour in a round cake pan or dish. Generously season both sides of veal shanks with salt and pepper. Dip veal in flour shaking off excess. Place veal in pan and sear both sides until golden. Remove from pan. 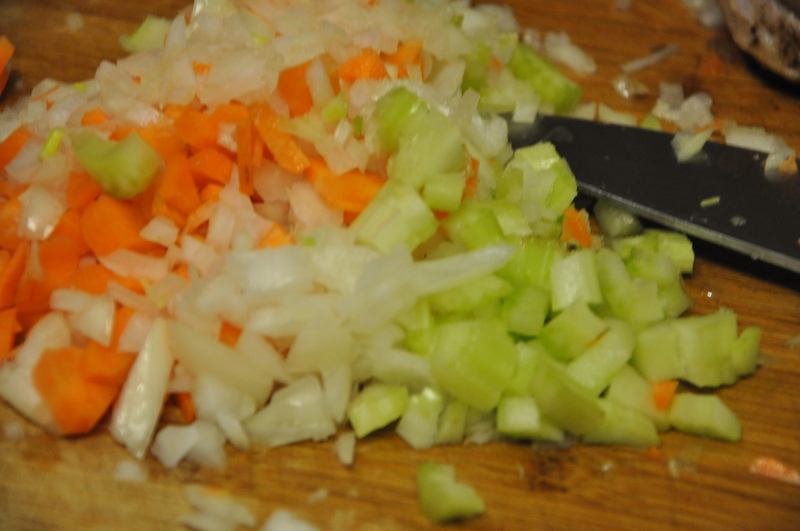 Add onions, carrots, celery and garlic. Cook until soft, about 5 minutes. 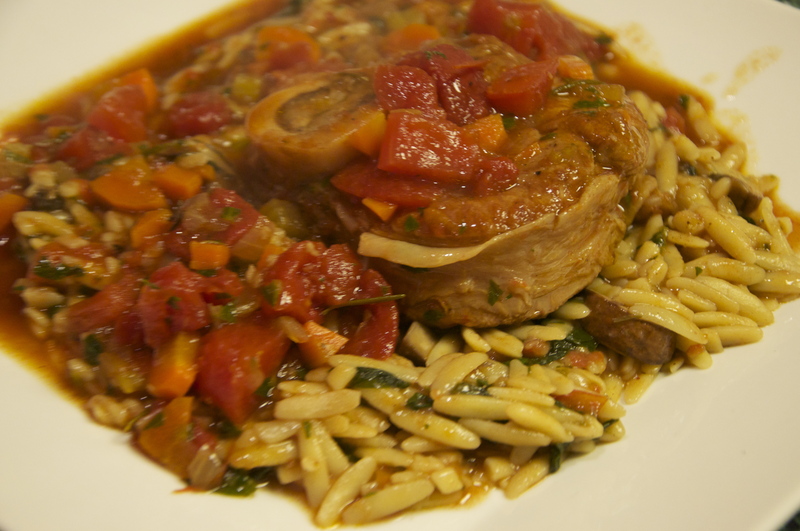 Place veal back into pot and add remaining ingredients (except the gremolata). Cook over very low heat for 2 hours, or until meat is very tender, but not falling off the bone. In a small bowl mix the gremolata. 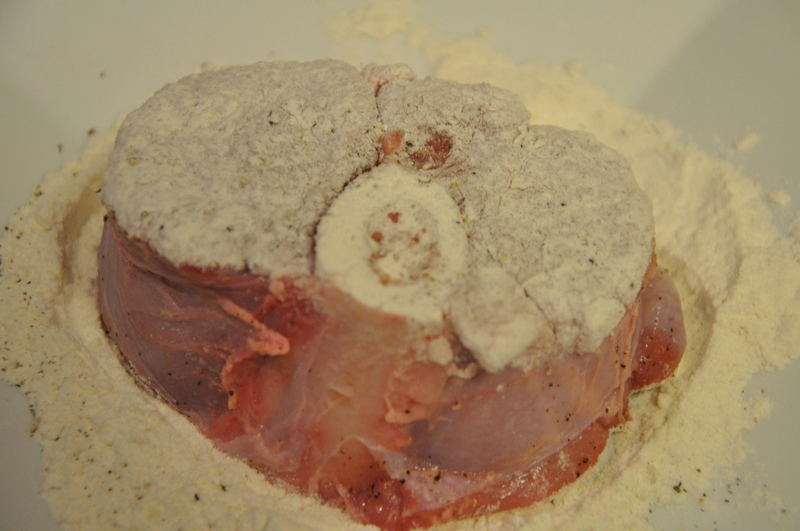 Mix into the ossoboco just before serving. 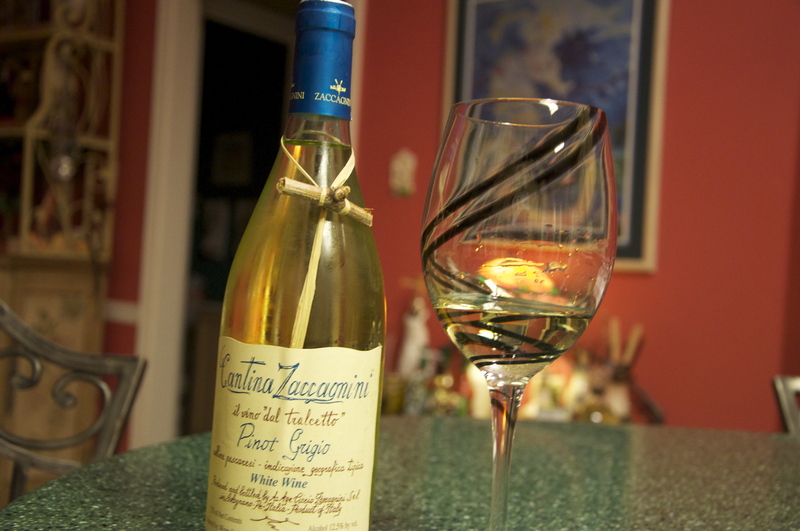 Pour yourself a nice glass of Pinot Grigio for a job well done…. Bon Appetito!